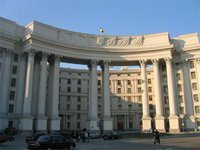 The preliminary information available to the Ukrainian Foreign Ministry confirms that Ukrainian citizens were not killed or injured in the two explosions that occurred near the finish line of the Boston Marathon on Monday. "Local police have said that there were no dead or injured Ukrainians as of 10:00 p.m. Boston time," the ministry's acting spokesman Yevhen Perebyinis told Interfax-Ukraine. At least three people were killed and another 150 were injured in the April 15 blasts. Six Ukrainian citizens were registered on the Boston Marathon Web site.